The White-winged Widowbird Euplectes albonotatus is common in East and south-east Africa (see map below), based on Birds of Africa). It occurs tall bushed grassland, generally below 2000m. It is a small widowbird with a fan-shaped tail. The male in breeding plumage is black with a white wing-patch and wing edgings, and white underwing; in southern African birds the epaulet (shoulder patch) is yellow (above left), while in East African birds it is cinnamon-rufous. Females (above right) and non-breeding birds may be identified in flight by the longish tail, white and yellow/rufous wing patches, and white underwing. 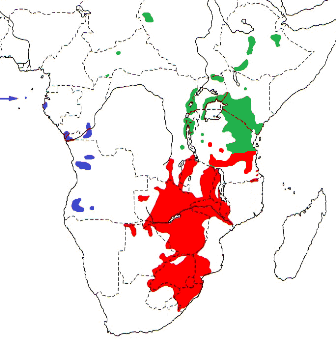 E. a. albonotatus in eastern South Africa, north-east Botswana and Namibia, to southern Tanzania (intergrading with eques around Iringa and Dodoma) (see red on map left). E. a. asymmetrurus found patchily from western Angola to western Gabon, and Sao Tome (see blue on map left). The tail of breeding males is much larger in this subspecies. E. a. eques from southern Tanzania to southern Sudan and Ethiopia with isolated populations in western Sudan and Central African Republic (see green on map left). Breeding males have cinnamon-brown (not yellow) epaulets, and females and sub-adult males have the lesser coverts edged with cinnamon. 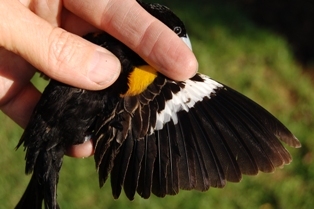 The White-winged Widowbird established a breeding population from escapees in the Sydney area in Australia, but apparently was extinct there by 1976 (read more here). This species has shown a substantial range expansion in the Free State Province of South Africa since the 1990s. Ornithologists in the Free State attribute this to increased rainfall (see maps and report here). The White-winged Widowbird feeds on grass seeds, nectar of Aloe marlothii, and insects, including termite alates. This species is polygynous, with up to 4 females per male. The nest (right, from phown 1032 by Dawie de Swardt) is oval with a large side entrance. The male builds the nest frame of dry and semi-green grass, supported by upright grass stems. The female adds a stouter weaving of finer dry grass, usually Sporobolus, inside the frame. Some nests have a small porch of projecting grassheads. Nests are usually sited below 1.5 m. Eggs may be laid before the nest is lined. Old nests may be used by Orange-breasted (Zebra) Waxbills. 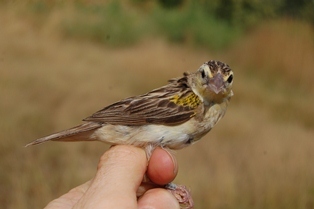 There is one photo PHOWN record from the Free State and 15 Nest Record Cards from Angola (see PHOWN summary ). Submit any weaver nest records to PHOWN (PHOtos of Weaver Nests) via the Virtual Museum upload site.